Hi, I am interested in your 1967 Chevrolet Camaro (stock #5115-CHA) listed on Autotrader for $44,995. I'd like to get more information about this vehicle and confirm its availability. 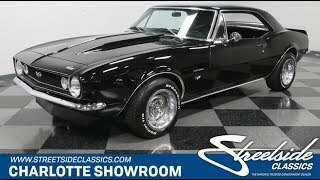 This 1967 Chevrolet Camaro SS tribute has the timeless appeal of the first-year for this muscle car legend. But what really has you attracted to this one are all the upgrades, like the strong V8, four-on-the-floor, four-wheel disc brakes, A/C interior, and full midnight package. A Camaro finished in slick black is always an instant icon. And this one has the nice gloss that comes from a more modern clearcoat and a professional hand applying it. Plus, the brightwork like the bumpers, rockers, and full trim really add to the whole packages shine. This is restored coupe, and you can also tell it was done by someone who understood how to give this icon its best look without jeopardizing its vintage appeal. You see it in places like the cowl induction hood, which was part of a later package, but we just love them so much on any powerful first-gen Camaro. Plus, the full-width rear spoiler, SS badging, and 15-inch Rally wheels are nice subtle upgrades that all show off the best this legend has to offer. Inside the blackout package continues. Not only do we love the look of a crisp black interior, but this also really lets the bright trim pop. This has all the best factory-style pieces like the bucket seats and a center console. Plus, they did a terrific job on integrating upgrades like the cold-blowing Vintage Air system, and the retro-style AM/FM digital tuner with a hookup for you modern iPod. While all this reminds you of good quality, what really keeps you coming back for more is the unbeatable combo of a grippy sports steering wheel (power steering) and the feeling of a stick shift in your right hand. Under the hood is a great-looking small block with a tidy setup, new insulation, and shining Chevrolet valve covers. This is Chevys 400 cubic-inch V8 which already offers one of the best small block displacements, and then they added go-fast goodies like a mild cam, four-barrel carburetor, Edelbrock aluminum intake, and shorty headers feeding the dual exhaust. Plus, you are in complete control over this enhanced V8 and its rumbling soundtrack thanks to the four-speed manual transmission. Plus, this has all the best in upgrades. You see it everywhere from the four-wheel disc brakes for superior stopping, to the aluminum radiator w/electric fan that can help keep you running cool even in traffic with the A/C pumping. Like your favorite cup of coffee, this Camaro is strong, black, and absolutely classic. Call now!